None of my tracks running today and I'm in the yard getting rid of leaves. Took a break and just luckily I tune into Power Cap and think, why not.. Very nice call from you and the announcer. My Favorite Guy in the sky looked kindly upon Spy In the Sky today as he rolled to a facile win at 10-1. 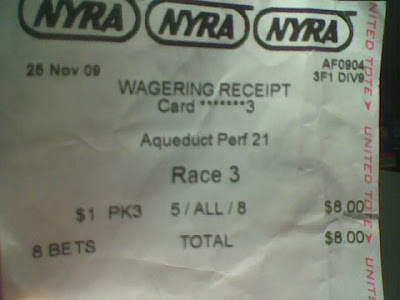 When you only make one bet on the day and the win returns $22.40 with the exacta returning $372 you are having a good day. Nice job RG, 10-1 sure beats raking the leaves. You may be able to hire someone now. Nice call, too bad i missed out. Way to call it, Mr. Power Cap. Good luck in SA this weekend.